Rising rates in the United States have sent shock waves across a number of emerging markets, particularly in nations with high current account deficits. At the top of the list of most vulnerable emerging economies in 2014 is Turkey. The country not only faces a large current account hole that it needs to plug but also tremendous political uncertainty - a combination of risks that can be devastating for an emerging economy. In fact the political situation has become quite precarious in recent weeks. The Economist: - In the past two weeks a Turkish prosecutor has detained dozens of people as part of investigations into illicit gold transfers and bribes allegedly paid by the construction industry. The suspects include businessmen close to the ruling Justice and Development (AK) party, as well as officials, politicians and the sons of three cabinet ministers. The prime minister, Recep Tayyip Erdogan , combative at the best of times, reacted with fury—stoked by reports that one of his own sons was next on the list. He reshuffled his government to put loyalists in place, sought to gain control of police investigations, and got the prosecutor removed from the corruption case. His ministers justified all this with talk of a “soft coup”. Turkish currency, the lira, has touched new lows in recent days, with the nation's bonds (see chart) and stocks (see story) punished as well. It's a dangerous development because such currency weakness can and will ignite inflationary pressures that could quickly lead to further social unrest. Turkey's central bank (CBRT) has been trying to defend the lira using foreign reserves. 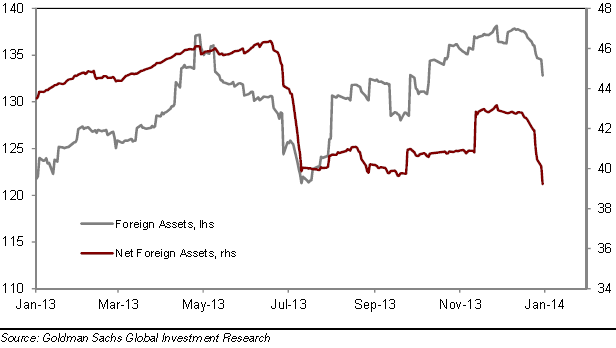 But that strategy is quite limited in scope, as foreign assets started a sharp decline in recent weeks. With foreign investment slowing due to political uncertainty, the only other option for the CBRT is to raise short-term rates to make it more expensive to short the lira. But in an environment of such political uncertainty the central bank is no longer independent. It is therefore difficult to envision the CBRT raising rates sufficiently to stem the lira's decline. Doing something as unpopular as a major interest rate hike in an economy that is barely growing could quickly end careers (or worse) for the decision makers at CBRT. It is therefore quite likely that the Turkish lira will continue its slide in 2014 and beyond. Sadly, with that decline will come higher consumer prices, more pain for Turkish companies who borrowed in foreign currency (see story), more social unrest, and more political uncertainty.